This transformation template is used in every Joiner and also in Reformat and DataIntersection. Here is an example of how the Source tab for defining the transformation in CTL looks. Called repeatedly for each set of joined or intersected input records (Joiners and DataIntersection) and for each input record (Reformat). Allows you to map input fields to the output fields using a script. If any part of the transform() function for some output record causes fail of the transform() function, and if the user has defined another function (transformOnError()), processing continues in this transformOnError() at the place where transform() failed. If transform() fails and the user has not defined any transformOnError(), the whole graph will fail. The transformOnError() function gets the information gathered by transform() that was gotten from previously successfully processed code. Also an error message and stack trace are passed to transformOnError(). It creates output records. If any part of the transform() function for some output record causes fail of the function, and if the user has defined another function (transformOnError()), processing continues in this transformOnError() at the place where transform() failed. Called in any time specified by the user (called only when transform() returns value less than or equal to -2). May be used to allocate and initialize resources required by the transformation. All resources allocated within this function should be released by the postExecute() function. 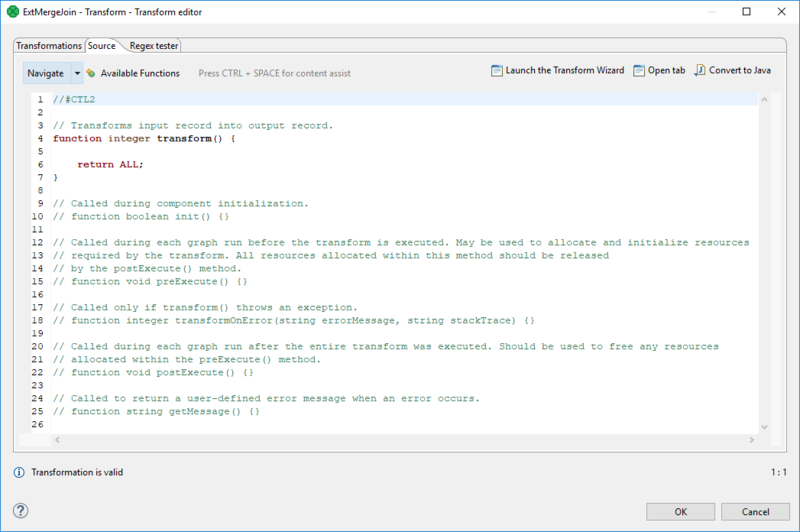 Both inputs and outputs are accessible within the transform() and transformOnError() functions only.